Here is a picture of me holding Inky. My sister, Joan is holding her kitten. We called her kitten Crybaby because it cried a lot. My Daddy took this picture. I love kittens! 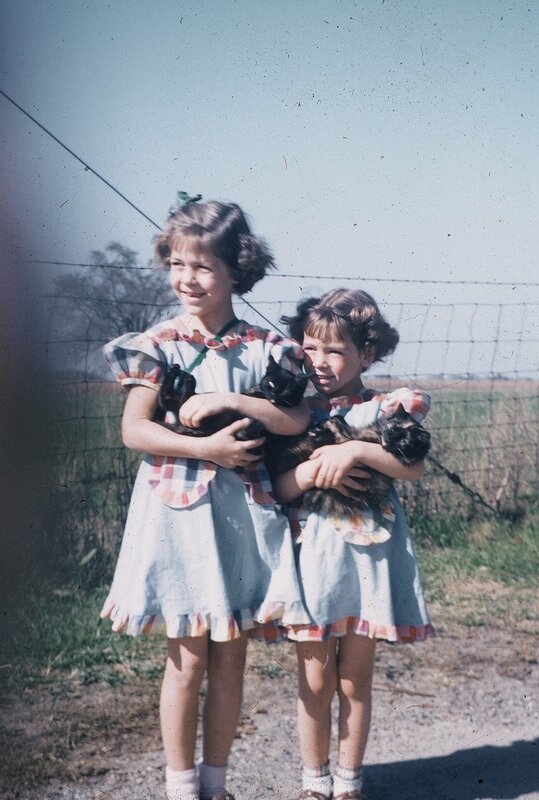 When we moved to the farm where grandma and grandpa used to live and where Daddy grew up, there were always lots of cats and kittens. One time I counted as many as fourteen! What I really liked was to find baby kittens. If a mama kitty went from fat to skinny we knew she had kittens somewhere. Our mama kitties usually had them in the haymow of the barn. Sometimes we would find the babies before their eyes were opened. Mama told us not to pick them up until they opened their eyes. I thought of a good trick for finding the babies. I would walk around the barn and up in the haymow crying “mew mew” real soft like a kitten. Then I would stop and listen. If they were sleeping and the mama kitty was away they might wake up and think it was her. Then they would start crying. All we had to do then was look where the sound came from. My favorite kitten was Inky. I remember when she was very tiny. She was all black except for a little patch of white under her chin. When she first opened her eyes they were bright blue. They looked so big in her tiny body. Inky would look at me with those big blue eyes and back away. I could tell she was afraid, so I gently picked her up and held her real easy so she would know I didn’t want to hurt her. Before long Inky would come to me every time I went to the haymow where the kittens were. By the time they were big enough to go wherever they wanted, Inky followed me everywhere. Sometimes that was a problem. I got a Brownie camera for my birthday when I turned eight, and I tried to take a picture of Inky. I was supposed to stand eight feet away from something to take its picture. I put Inky in a good place for a picture and backed away, but every time I got about five steps away Inky would walk up to me. I finally gave up and took a picture of another cat that looked almost like Inky. Inky was one of the best friends I had when we lived on the farm. She still has a special place in my heart.